Hi everyone! 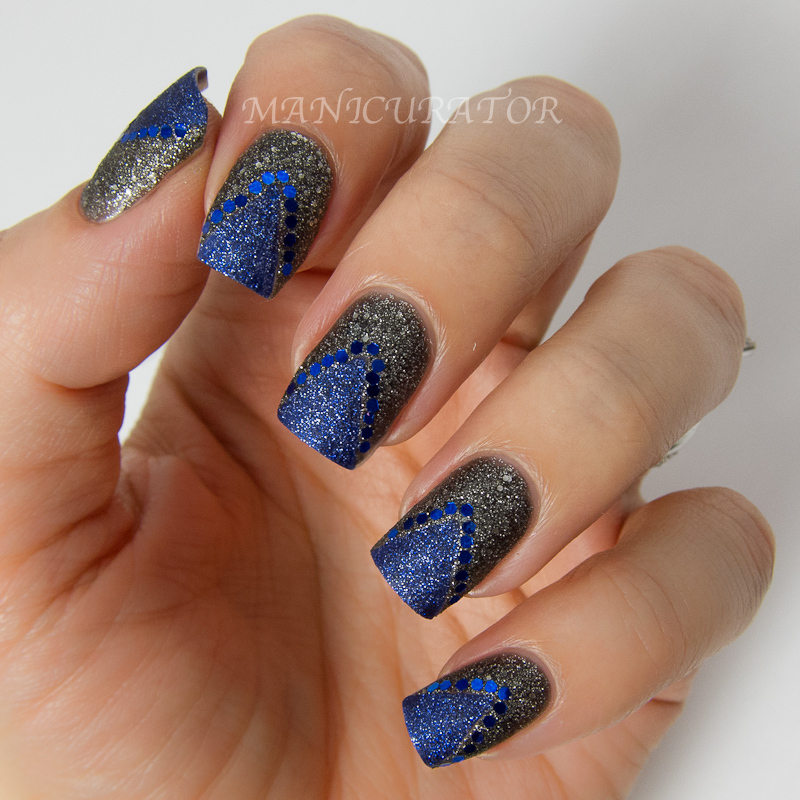 Excited to share with you the manicure I did for our "bling" theme. 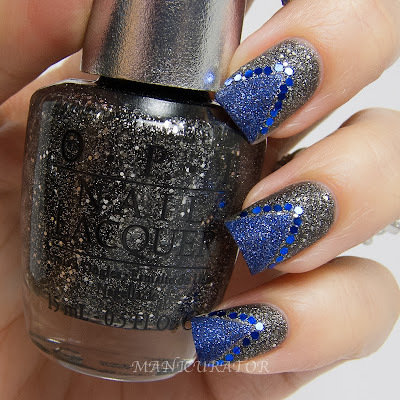 I used the two new OPI Granite DS shades – DS Pewter and DS Lapis. Part of the Designer Series by OPI collection. These both are both matte textured with "mineral-like reflections". DS Pewter, a matte textured metallic with deep silver ore, will launch simultaneously with DS Lapis, a deep sapphire blue with a textured matte finish. DS Pewter and DS Lapis will be available beginning September 2013 at professional salons, including Beauty Brands, Beauty First, Chatters, Dillard’s, jcp Salons, Pure Beauty, Regis, Trade Secret, ULTA and ulta.com for $12.50 ($14.95 CAN) suggested retail for each nail lacquer. 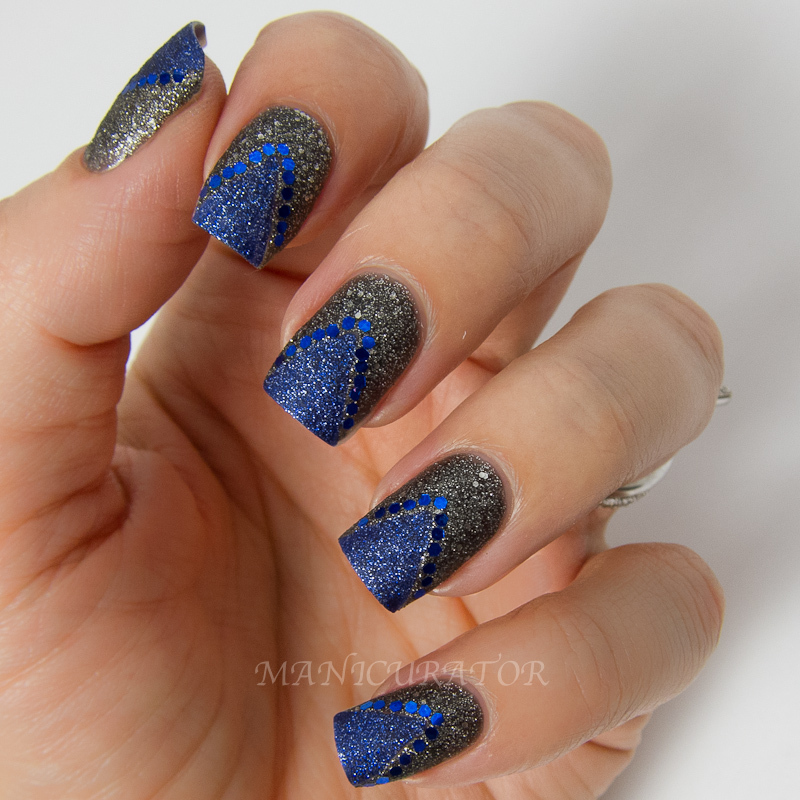 The first step to this mani was to cut out 5 triangle shapes in my tape and place them on my nail (they went where the blue is now. I made sure they were secure on the nail and then painted 2 coats of OPI DS Pewter and lifted the tape. Perfect black textured and glittery shade for Fall/Winter, or really any season you feel like rockin it! While the Pewter was still wet, I applied my loose glitter one at a time. 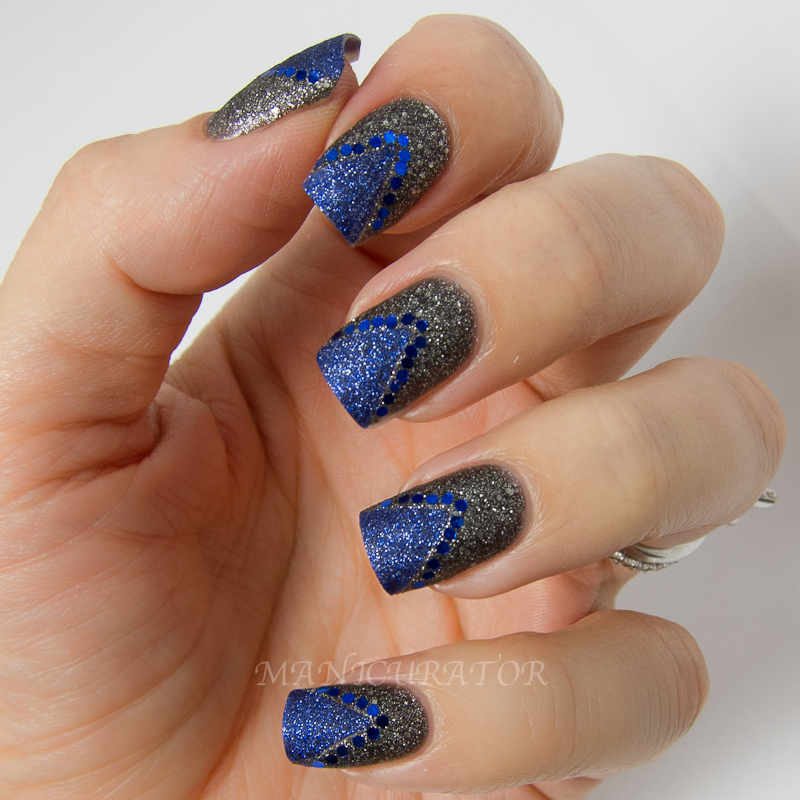 Lastly, I filled in the triangle (free hand) with OPI DS Lapis. Big fan of blues over here, so I'm very happy to add this one to the collection. I used two coats here. No problems with formula or application for either of these. I do really like this! subtle, but beautiful! 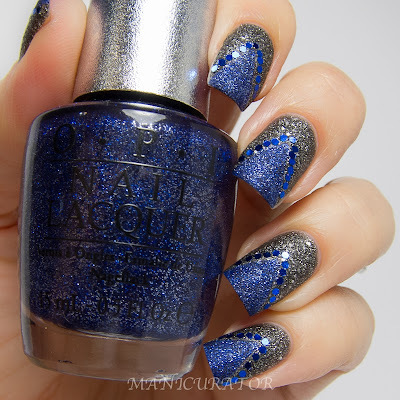 Wow, such a cool mani! I love this look! 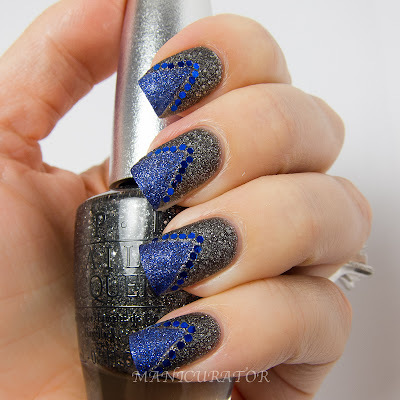 Those polishes are stunning! Love this! It's absolutely gorgeous! Love what you've done here! 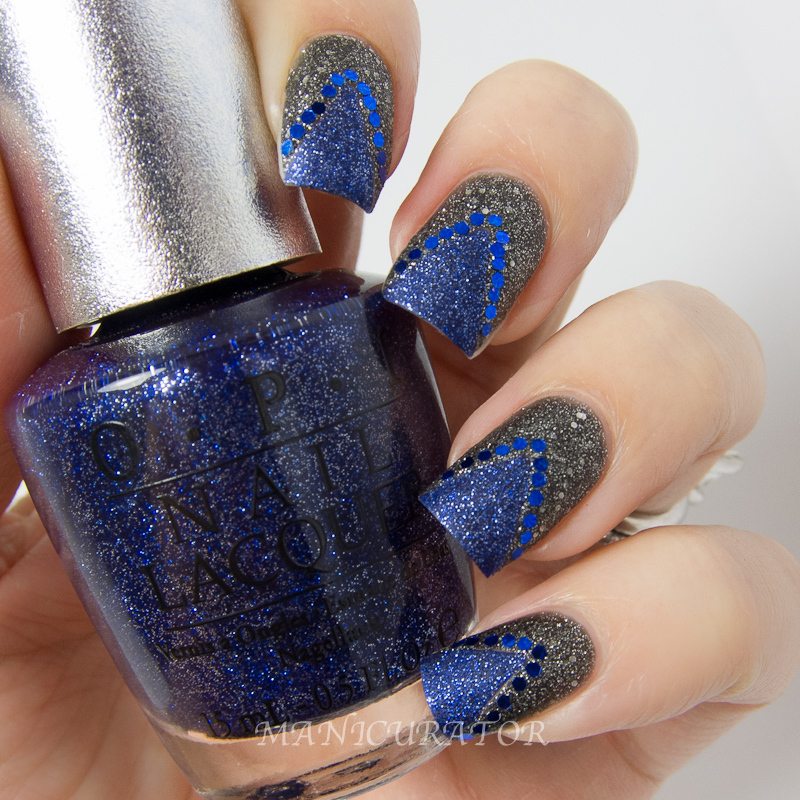 I am so so excited about these new OPI DS shades! Very pretty!! I need these new DS's in my life stat!